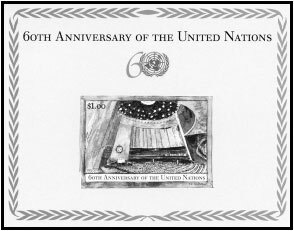 United Nations - On Feb.4, 2005, the United Nations Postal Administration issued souvenir sheets commemorating the U.N.'s 60th anniversary. The U.N. New York office souvenir sheet sold out by March 7. The sheet is engraved by great stamp engraver Czeslaw Slania. Slania started engraving Polish stamps in 1951. After immigrating to Sweden in 1959, he engraved stamps for Sweden, Denmark, Monaco, the United Nations and others. His beautiful work won him world acclaim. His engraved designs were used on all three 60th anniversary sheets and the matching stamps for each of the U.N. offices in New York, Geneva and Vienna. The designs are beautiful representations of the U.N. New York General Assembly building. The New York, Geneva and Vienna souvenir sheets are denominated $1, 3 francs and .2.10, respectively. Print quantities for the souvenir sheets are 135,000 for New York, 125,000 for Geneva and 165,000 for Vienna. Slanias last souvenir sheets are expected to increase in value. It is quite clear that there are not enough of these sheets to satisfy collector demand. Because some were used on first-day covers, there are even less to go around. Interest in collecting U.N. stamps, especially internationally, has been on the increase for some time. The sell-out of the New York sheet shows that the rush has begun. You might have to pay a premium for the New York sheet. The others are available from the appropriate U.N. post offices as of late March, but that might not last for long. Acquire these sheets as soon as possible. I think they are sure to increase in value.